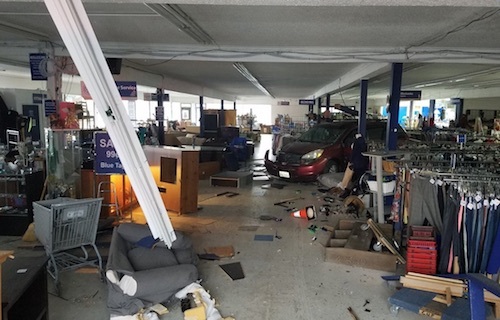 A woman was badly injured in a car accident Monday when a car plowed through a wall and into a thrift store in Burien, according to the King County Sheriff’s Office. The incident occurred around 12:30 p.m. in the 13400 block of 1st Avenue Southwest. The crash left a huge hole in the side of the St. Vincent de Paul Society thrift store. The car was several feet inside the business, surrounded by damaged goods and debris. A woman inside the store at the time of the crash was struck and sustained minor injuries. She was taken to a local hospital for treatment. The driver of the car was not injured. In 2012, Davis Law Group helped recover a $1.35 million wrongful death settlement after a vehicle-into-building crash. Our client, Kaye, was a 60-year-old woman working as an office manager for an insurance company in Renton when a devastating car accident took her life. Kaye's husband, Larry, said he and his family interviewed a total of three law firms before they eventually decided to hire Davis Law Group "for a myriad of reasons." The case went to a jury trial, but both sides decided to settle the case for $1.35 million before the trial was completed. The storefront accident lawyers of Davis Law Group have experience in a broad range of cases involving vehicle-into-building crashes. We can help you and your family pursue financial compensation for your medical bills, lost wages, and pain and suffering. Contact our offices at (206) 727-4000 today.